as much as i love ogling a glamorous pair of designer heels, when it comes to buying them, i prefer to keep the cost down. i will splurge on everyday workhorse items (like my beloved ankle boots or PS1), but i balk when it comes to dressier occasion pieces that won't get the daily rotation. what makes it more tricky is the comfort + style factor. i have a pretty low tolerance for pain when it comes to heels, and loathe the idea held by some that "women should just deal with it". (guys don't put up with painful shoes, so why should we?) i also have a low tolerance for shoddy quality. one basic rule is that all my shoes have to have leather uppers and linings, and ideally a leather outsole, or if not, a quality wood or rubber one. after years of trial and error, Corso Como and Jeffrey Campbell have become my favorite go-to affordable brands for well made, stylish heels that are also very comfortable. some of the JC styles are super over-the-top and fetish-y, but don't be scared off. my favorite is definitely the simple suede platform. very sturdy heel, and the design is sophisticated while looking more expensive than it is – no simple feat for platforms! the CC heels are more classic, available in a ton of colors and leathers, and i really like that you can easily wear them for work and dressier occasions. note on sizing: the JC and CC styles i own run true to size, and are a comfy regular-width. what do you think? do you like to spend more or less on your heels? Fantastic post! I've been having the hardest time looking for comfy heels. I just can't bear the thought of staggering around in painful heels when I'm supposed to be on my feet all day. I love your breton dress and Helmut Lang trench. So so so chic! thanks :) it always surprises me that more people aren't aware of the, ahem, health issues caused by ill-fitting / painful heels! i mean, men would be up in arms if they had to deal with half the things we have to deal with in ridiculous footwear! Terrific post. I agree that your everyday "workhorse" pieces should be the best quality you can afford. It's good to know about Corso Como and Jeff Campbell shoes-- I rarely wear pumps/heels so I'm reluctant to spend much on them, yet I hate shoddy and/or uncomfortable shoes. I have one pair of lovely black Chie Mihara high heels for dressy occasions. My most comfortable heels that have held up well are by Kenneth Cole New York or Michael Kors lines (after some modifications). Nine West can be hit or miss. However, even my most comfortable heels despite years of wear, one day that I stand for 8 hrs straight flattens the cushioning on the insole. (It’s the standing, not the walking that destroys you). I only have one pair of shoes that I spent more than $200 on, a thigh high black leather boot, so materials wise it makes sense. It’s inelegant but the best thing I’ve found comfort-wise is Dr. Scholl's 16 Hour Insole. Those little foam insoles hardly work. Lovely dress! There's something about that dress that calls for a classic trench. I have the Chanel-esque quilted heels. They were my go-to all spring and early fall. They are so chic, comfortable and well-made. I had my cobbler make a modifications for my narrow feet. I constantly receive compliments on them. I do spend on heels. I'm very discerning when it comes to shoes, but always end up wearing them for years. i remember seeing them on your blog! :) you wore them so beautifully with white jeans. You know, for me it really depends on the shoe. I have a pair of gold sequin Givenchy heels, they to me are special, and unlike anything else that I could buy from a label like JC. It's why when possible, I try to buy these in good second hand condition. Like you, if I'm spending money on shoes, I want them to be leather - or at least of good quality materials. I can't remember the last time I bought a pair of "plastic" shoes. Will definitely be looking to JC next time I need a pair of sandals though that is for sure! Lovely dress, and I adore the Chanel-esque heels! I'd rather not spend a fortune on shoes that I don't wear a lot, but I still want them to be comfortable and of a reasonable quality. I'm usually able to find quality shoes on sale though. I never wear heels except for job interviews (because corporate wear looks terrible with flats) and dressy evening things (and even then, only some times). I bought a pair of heels from Massimo Dutti earlier this year and they're excellent but I think their shoes can be hit or miss. Did you ever see Pedder Red in Shanghai? It's an offshoot of On Pedder which sells designer accessories, and they carry their own in-house range. They always have great styles and are of decent quality, and while they are a little expensive for what they are, they have excellent end of season sales. Witchery is also great for comfy heels; my sisters swear by them because they are so good for big, broad feet. I love your look! Being short, I have an ongoing love-hate relationship with heels. Growing up, I thought I needed them but always hated actually wearing them. I supinate quite a bit and rolled ankles many times. I am in agreement that I try to spend my moolah on workhorses in my wardrobe like black ankle boots but during the recent sales, I do believe I've found my perfect heels - the Alexander Wang Inna sandals (http://www.alexanderwang.com/products/304109p12/inna). I'll do a post on these soon. I have a terrible time finding shoes that fit - dressy or no. 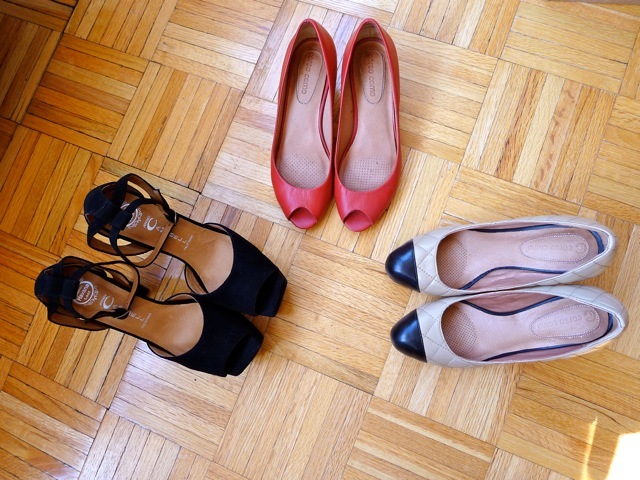 I don't wear heels very often (no need), so I only have exactly three pairs of them. I find that Ferragamo pumps work well for my feet and a pair of black Vara pumps have lasted me quite a while through all the formal, work occasions I need. J. Crew shoes to me are a hit or miss - I haven't found a pair that's been wildly comfortable. I tend to splurge on shoes (heels or no) mostly because I'm dressed so drab and boring all the time, shoes sort of become the focal point for my outfit. agreed on the ferragamos - they're excellent wardrobe investments. mine are even more in rotation during the holiday season, and just did a post on them for nye! Great to hear about some brands which hit the comfortable/nice/affordable trifecta! Thanks for the recommendations, will check them out for future shoe purchases. these look great, and I love your dress. My problem is finding all-leather ballet flats and pumps that are WIDE enough. There are some Cole Haans that look like they might work, and Stuart Weitzman makes some.... can you attest to the comfort of those brands by any chance? or do you know of any designers who make wide shoes? I agree about Jeffrey Campbell, but had never heard about Corso Como. Thank you. Nothing beats a comfy pair of heels! I always prefer to spend less but usually end up paying more for a good quality, comfortable heel. Ahh thinking about internships next summer and having to enter the work force in two years (agh! Reality is knocking at my door), I've been thinking about comfy work heels as well. Nice post!